Kenya safari packages make it easy to experience Kenya’s diverse wildlife, colourful tribal culture, white sandy beaches and spectacular landscapes. Most Kenya safari tours start in Nairobi, the capital of Kenya and take you to world-famous destinations such as Masai Mara, Lake Nakuru, Samburu and Mombasa. The Kenya safari packages here feature both group tours with fixed departure days and private tours making them ideal for single travellers, families, honeymoon couples and romantics. Kenya has numerous attractions and to get the most out of your African safari holiday, a safari of 7 days or more is recommended. Click here to get more detail of this and other Kenya safari packages. There are more than 120 all-inclusive Kenya safari packages – the tours can be customized. For mountain climbing adventures see the Mount Kenya climbing tours and Mt. Kilimanjaro trekking tours. If you’re short on time, this safari package serves up the colours, culture, and wildlife of Kenya in 4 incredible days. Visit Masai Mara, which offers excellent year-round game viewing and is also the setting of the yearly great wildebeest migration between July and October when over 2 million wildebeests, gazelles, zebras and elands trek from the Serengeti plains in Tanzania through the reserve and back again in search of water and pasture. 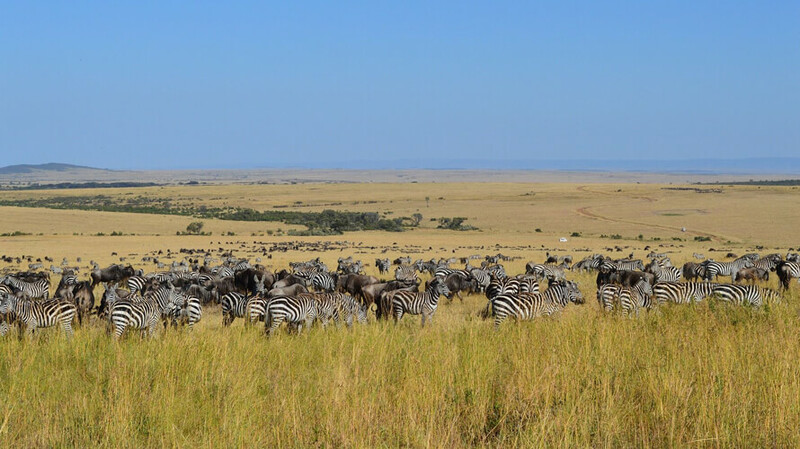 Among the popular short Kenya safari packages, the Masai Mara Experience – Independent takes you to the Masai Mara National Reserve, renowned for its high concentration of big cats, hundreds of bird varieties and the annual wildebeest migration. This Kenya safari package immerses you in the animal kingdom by taking you to the finest game parks in Kenya. You get to visit Masai Mara, the continents most popular wildlife reserve, Lake Nakuru, Lake Naivasha and Loita Hills, home to the Maasai tribespeople. This safari embodies images of a classic safari in superb style. The impressions of acacia dotted savannas, hundreds of different bird species and herds of migrating wildebeest and zebra pursued relentlessly by their predators. You get to visit the legendary Masai Mara National Reserve. Any wilderness fan or photographer will be particularly attracted by this safari. Live a real Lion King moment on this 8-day Kenya safari package to Kenya’s famous parks. 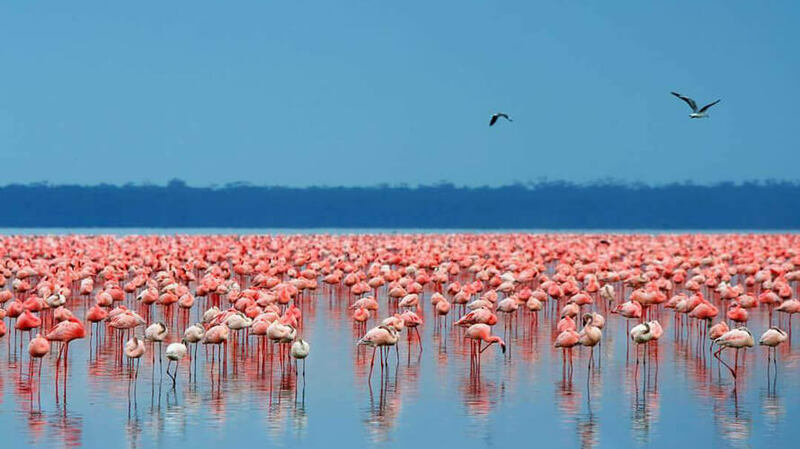 Visit Aberdare National Park, and stay at The Ark Lodge, a Noah’s Ark model lodge, Lake Nakuru National Park, where over a million flamingos and pelicans can be seen in the shallow alkaline lake and the Masai Mara National Reserve. This safari package takes you to Amboseli National Park’s unique protected habitat, plus 30,000 acre private wilderness conservancy. Amboseli is famed for its huge herds of elephants and excellent birding. The park also offers breathtaking views of snow capped Mount Kilimanjaro the highest free standing mountain in the world. The tour also takes you to Meru National Park, one of Kenya’s best-kept secret and Masai Mara National Reserve. Among the popular Kenya safari packages, this private safari takes you to Amboseli, Ol Pejeta Conservancy, Lake Nakuru National Park and Masai Mara National Reserve. Among the popular Kenya safari packages for first-time safarigoers, families and honeymooners, the Kenya Safari Experience takes you to Masai Mara, Lake Nakuru National Park and Amboseli National Park. The tour package can easily be combined with a beach extension. Among the popular Kenya safari packages, this tour takes you to Amboseli National Park, Samburu National Reserve, home to a diverse population of animals including the Samburu “Special 5”, which are unique to this part of Kenya. These consist of the reticulated giraffe, Grevy’s zebra, Beisa oryx, Somali ostrich and the gerenuk, a long-necked antelope that feeds while standing on its hind feet. You also visit Lake Nakuru and the Masai Mara. Explore the wonders of Kenya and Tanzania in this incredible overland adventure. It takes you deep into the heartland of the Maasai tribespeople and the finest wildlife parks in eastern Africa. In Kenya you visit Lake Nakuru, Lake Naivasha, Loita Hills, Masai Mara, Kisii and Lake Victoria. In Tanzania you visit Serengeti, Ngorongoro Crater and Meserani. To see all the Kenya safari packages and to book, click here. You can submit an inquiry for a tailor-made itinerary here.